Why are you applying to this boot camp? Whether you’re applying to one or multiple boot camps, show in your applications that you’ve done your homework and have a reason for applying to each specific program. Perhaps you’ve spoken to an alumnus, read reviews online, or attended a sample class and enjoyed learning from the teacher. Almost every boot camp has in‐person or live video info sessions covering the boot camp curriculum, alumni, and application. Attend at least a few to get a sense of the boot camp and what your expectations should be. What is your previous coding experience? Don’t fret if you don’t have formal coding experience. The real question here is if you previously tried to learn to code, especially because many free resources are available online. It’s worth trying to code before applying because boot camps assign prework — online courses you must complete before you join. If you’ve completed some online coding courses or, better yet, built a website (no matter how simple), include the course name or website address in your application. Codecademy.com is one of several free resources with online courses that many boot camps assign as prework. Why do you want to become a programmer? Describe a time when you solved a complex problem in a structured, step‐by‐step way. Many problems you’ll face when coding will seem impossible to solve. If you try solutions at random or haphazardly, reaching a resolution will take much longer. The key to solving any complex problem is to list every step that might be at fault, and then methodically test each step. For example, if you turn on a light switch and the light bulb doesn’t turn on, you know the problem must either be the light switch, the wiring to the light socket, the light socket itself, or the light bulb. You can find the problem by testing or replacing each part, usually starting with the light bulb. Debugging a program follows a similar process. If you haven’t debugged a program, describe any complex process or problem and the systematic approach you used to find the answer. Describe your previous educational and professional experiences. Neither a college degree nor a current job is necessary to join a coding boot camp, though both show the ability to follow through with a commitment. For education, list anything that might show your aptitude and ability to learn. If you did not receive a college degree, include completed courses. For professional experiences, a history of consistent employment and increasing responsibility are positive signals of your future ability to be a good employee. Write a program that counts the numbers from 3 to 117. But for multiples of 3, add 3 instead of 1, and for multiples of 5, add 5 instead of 1. For numbers that are multiples of both 3 and 5, add 15 instead of 1. Boot camp applications can include a programming challenge, like the preceding question from the Zipfian Academy application, which requires you to write code. You can usually write the answer in any programming language — understanding your logic is the most important part of the question. This specific question is a variation of a popular programming challenge called Fizzbuzz and can be solved by using a programming loop and testing each number for its divisibility by 3, 5, and 15. 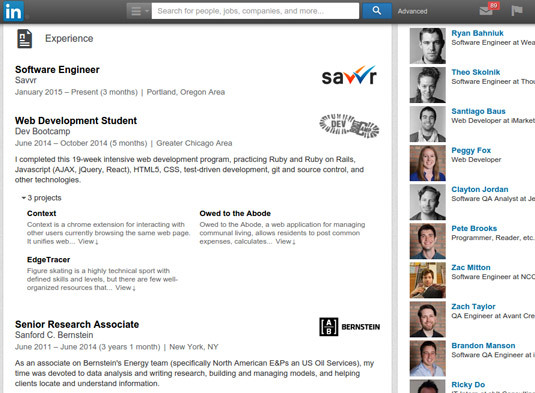 After you start looking for a coding job, your LinkedIn profile is a critical piece of your application. Get your profile in shape now and update your profile to include an accurate employment history, descriptions of each employer and role, and the leadership positions or effect you had. Update your profile to include complete employer history and descriptions. Some boot camps will ask if you’re an international applicant in need of a visa. The overwhelming majority of boot camps are not officially recognized educational institutions. Although previous students may have successfully applied for visas, it is unlikely that the boot camp will be able to give you a great deal of assistance with the visa process.